Although WhatsApp has over a billion users, it is not uncommon to find people who haven’t used this free and popular Messaging service. Hence, this guide to make it easy for new comers to download, setup and use WhatsApp on iPhone. 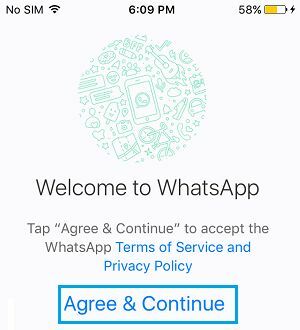 After downloading the iOS version of WhatsApp from the App Store, all that you need to do is open the app on your phone and follow the instructions to setup WhatsApp on your iPhone. You will find below the exact steps along with relevant screen shots, illustrating the entire process of downloading and setting up WhatsApp on an iPhone. While you do need an active phone number to get WhatsApp working on your iPhone, there is also a way to use WhatsApp Without Phone Number or SIM card. Follow the steps below to download the iOS version of WhatsApp to your iPhone. 2. 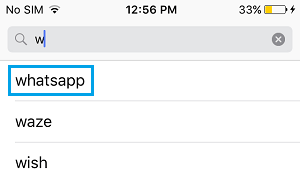 Once you are on App Store, tap on the Search icon from the bottom menu. 3. 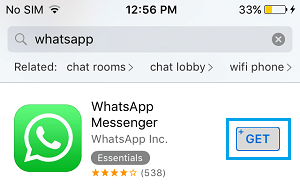 Search for WhatsApp in the App Store by typing “WhatsApp” in the search bar and tap on WhatsApp as it comes up in search results. 5. You may be prompted to login to your iTunes Account by entering your Apple ID and Password. 6. Patiently, wait For WhatsApp to be downloaded to your iPhone. Now that you have downloaded the iOS version of WhatsApp to your iPhone, the next step is to Setup WhatsApp to work on your iPhone. 2. On the next two screens, WhatsApp will seek permission to Access your Contacts and provide you with Notifications. Tap on Accept on both screens. 4. 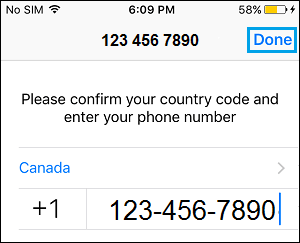 On the next screen, select your Country, enter your Phone Number and tap on Done from the top right corner of your screen (See image below). 6. On the next screen, enter the six digit Verification Code as received from WhatsApp. Do not close the screen or try to change the phone number, in case you did not receive the verification code by SMS. 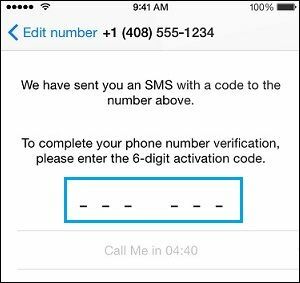 Just wait for five minutes and tap on the Call Me option to receive the verification code via WhatsApp Automated Calling system. 7. On the next screen, enter your Name and tap on Done from the top right corner of your screen. Once WhatsApp has verified your phone number, you are all set to use WhatsApp on your iPhone to Chat with and make calls to your Contacts on WhatsApp. The next step is to complete your WhatsApp profile so that your Contacts can easily recognize you. 2. Next, tap on the Settings option from the bottom menu. 3. 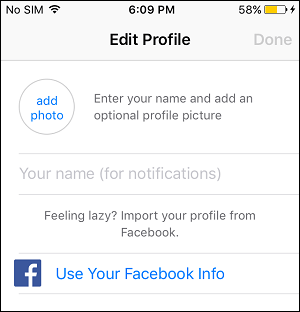 On WhatsApp Settings screen, tap on your Name to access the Edit profile screen. 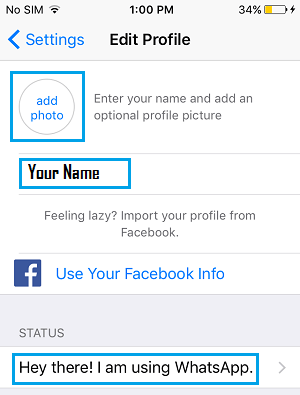 Note: You can also import your Facebook Profile to WhatsApp by tapping on Use Your Facebook Info. 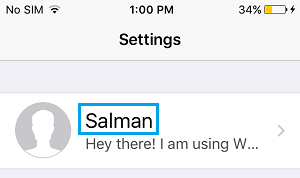 Once activated, WhatsApp automatically goes through your Contact List on iPhone and adds Contacts to your WhatsApp account (those who are on WhatsApp). 2. Next, tap on the Contacts tab from the bottom Menu. 3. On the Contacts screen, tap on the + icon located at the top right corner of your screen to add New Contacts. 4. On the next screen, you can fill in the Name, Phone Number and other details of the Contact. 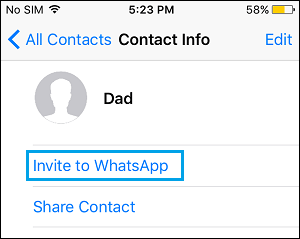 In case some of your iPhone Contacts are not on WhatsApp, you will need to send them an invitation to join WhatsApp by following the steps below. 3. On the Contacts Screen, tap on the Name of the Contact that you want to send the WhatsApp Message to. 5. The next screen will open with a ready to send Message, simply tap on Send to send a WhatsApp invitation to your Contact. 3. Next, tap on the Contact’s Name that you would like to Chat with.